On a cold and foggy morning we all met at the Knighton Hotel in Knighton Powys, thirteen dogs and handlers all ready to take part in the Sussex Spaniel Association Field Trial for minor breeds. 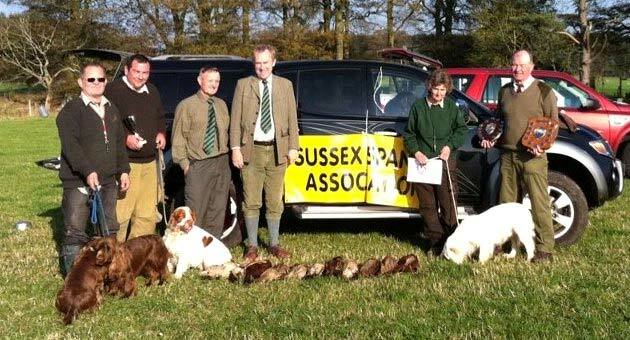 A total of two Sussex Spaniels and eleven Clumber Spaniels had arrived to take part in the trial on the wonderful scenic Bryn Shoot.After a very warm welcome from Bill Cadwell the Working Field Trial Secretary from the Sussex Spaniel Association he introduced the two judges for the day Mr Keith Carter and Mr Roy Langford. We moved off in convoy to the shoot and on arriving we found that the ground we planned to use was still covered in low cloud so the judges deemed it unsafe to start on this ground, so we moved to a small valley on the shoot which had a small stream running down it with cover each side. The first to go were Margret Hughes with Etherridge Padraige (Clumber) & Kelly Jefferies with Sh Ch Jubilwell Whole Lotta Rosie (Clumber). We covered this ground for just over an hour by which time the cloud had lifted and we were able to move to the turnip fields at the top of the hills on the shoot. We spent the rest of the day walking the shoot in bright sunshine with the most fantastic back drop you could ever have. the breed and that was they found that some of the dogs were a bit hard mouthed and this could be worked on in training by using small birds to start retrieving with like pigeon and partridge before moving on to pheasants. Special congratulations should go to Chris Raper for winning the Best Novice.